To celebrate the 40th anniversary of the introduction of European Riesling grapes in the Traverse City area, which launched what is one of the world’s most admired wine regions, winemakers and restaurants will transform the enclave into the “City of Riesling” from July 26-28. 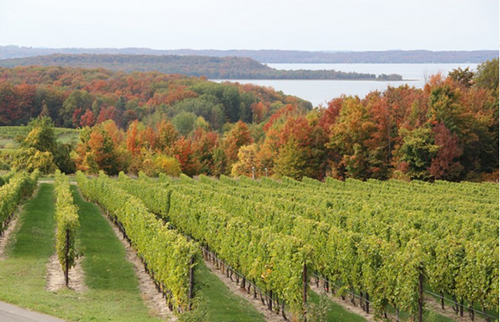 Today, there are some 40 wineries just of north of Traverse City on Old Mission and the Leelanau Peninsula. Ed O’Keefe, founder of Chateau Grand Traverse on Old Mission, started the industry in 1974 when he saw the ideal setting for growing Riesling grapes. O’Keefe’s son, Sean, and sommelier Amanda Danielson, co-owner of two area restaurants, Trattoria Stella and The Franklin, started the “City of Riesling” event. Activities throughout the three days include wine tastings, the “Riesling Oyster Riot,” the premiere of a short film called, Watch Your Back: A Riesling Movie, the Bar of 100 Rieslings in Clinch Park on Old Traverse Bay, and the introduction of a new book by wine writer Stuart Pigott called, Best Wine on Earth: The Riesling Story. On the final day, The Franklin will be turned into “Salon Riesling,” while food and wine tastings will be offered along with TED-style educational presentations. The event is designed to flow smoothly into the annual Traverse City Film Festival, which will run July 29 – Aug. 3.